In fact George Washington, who died in 1799 (many years before Darwin’s famous book came out), had tried his hand at what today would be called “genetic engineering.” He produced at least a few notable breeds of domestic animals through selective breeding. Those include a breed of giant mules – the “Mammoth Jackstock” breed. Those mules are so big and strong that they were used to pull large boats filled with coal along artificial canals in Pennsylvania. Washington learned the basic principles of animal breeding from others, who learned it from others, and so on. Animal breeding has a long tradition. So, not only did animal breeders, like George Washington, had known about the principles of mutation, inheritance, and selection of biological traits; but they also had been putting that knowledge into practice for quite some time before Darwin’s famous book “The Origin of Species” was published. Yet, Darwin’s theory has applications that extend well beyond animal breeding. There are thousands of phenomena that would look very “mysterious” today without Darwin’s theory. Many of those phenomena apply to nutrition and lifestyle, as we have been seeing lately with the paleo diet movement. Among the most amazing and counterintuitive are those in connection with the design of our brain. Recent research, for instance, suggests that “surprise” improves cognition. Let me illustrate this with a simple example. If you were studying a subject online that required memorization of key pieces of information (say, historical facts) and a surprise stimulus was “thrown” at you (say, a video clip of an attacking rattlesnake was shown on the screen), you would remember the key pieces of information (about historical facts) much better than if the surprise stimulus was not present! The underlying Darwinian reason for this phenomenon is that it is adaptively advantageous for our brain to enhance our memory in dangerous situations (e.g., an attack by a poisonous snake), because that would help us avoid those situations in the future (Kock et al., 2008; references listed at the end of this post). Related mental mechanisms increased our ancestors’ chances of survival over many generations, and became embedded in our brain’s design. Animal breeders knew that they could apply selection, via selective breeding, to any population of animals, and thus make certain traits evolve in a matter of a few dozen generations or less. This is known as artificial selection. Among those traits were metabolic traits. For example, a population of lambs may be bred to grow fatter on the same amount of food as leaner breeds. Forced natural selection may have been imposed on some of our ancestors, as I argue in this post, leading metabolic traits to evolve in as little as 396 years, or even less, depending on the circumstances. In a sense, forced selection would be a bit like artificial selection. If a group of our ancestors became geographically isolated from others, in an environment where only certain types of food were available, physiological and metabolic adaptations to those types of food might evolve. This is also true for the adoption of cultural practices; culture can also strongly influence evolution (see, e.g., McElreath & Boyd, 2007). By ancestors I am not talking about Homo erectus here, but ancestors that lived 3,000; 1,000; or even 500 years ago. At times when medical care and other modern amenities were not available, and thus selection pressures were stronger. For example, if your no-so-distant ancestors have consumed plenty of dairy, chances are you are better adapted to consume dairy than people whose ancestors have not. Very recent food inventions, like refined carbohydrates, refined sugars, and hydrogenated fats are too new to have influenced the genetic makeup of anybody living today. So, chances are, they are bad for the vast majority of us. (A small percentage of the population may not develop any hint of diseases of civilization after consuming them for years, but they are not going to be as healthy as they could be.) Other, not so recent, food inventions, such as olive oil, certain types of bread, certain types of dairy, may be better for some people than for others. Kock, N., Chatelain-Jardón, R., & Carmona, J. (2008). An experimental study of simulated web-based threats and their impact on knowledge communication effectiveness. IEEE Transactions on Professional Communication, 51(2), 183-197. McElreath, R., & Boyd, R. (2007). Mathematical models of social evolution: A guide for the perplexed. Chicago, IL: The University of Chicago Press. The idea that protein leaches calcium from the bones has been around for a while. It is related to the notion that protein, especially from animal foods, increases blood acidity. The body then uses its main reservoir of calcium, the bones, to reduce blood acidity. This post generally supports the opposite view, and adds a twist to it, related to plant protein consumption. The “eat-meat-lose-bone” idea has apparently become popular due to the position taken by Loren Cordain on the topic. Dr. Cordain has also made several important and invaluable contributions to our understanding of the diets of our Paleolithic ancestors. He has argued in his book, The Paleo Diet, and elsewhere that to counter the acid load of protein one should eat fruits and vegetables. The latter are believed to have an alkaline load. If the idea that protein leaches calcium from the bones is correct, one would expect to see a negative association between protein consumption and bone mineral density (BMD). This negative association should be particularly strong in people aged 50 and older, who are more vulnerable to BMD losses. As it turns out, this idea appears to be correct only for plant protein. Animal protein seems to be associated with an increase in BMD, at least according to a widely cited study by Promislow et al. (2002). The study shows that there is a positive multivariate association between animal protein consumption and BMD; an association that becomes negative when plant protein consumption is considered. The study focused on 572 women and 388 men aged 55–92 years living in Rancho Bernardo, California. Food frequency questionnaires were administered in the 1988–1992 period, and BMD was measured 4 years later. The bar chart below shows the approximate increases in BMD (in g/cm^2) for each 15 g/d increment in protein intake. The authors reported increments in BMD for different increments of protein (15 and 5 g/d), so the results above are adjusted somewhat from the original values reported in the article. Keeping that in mind, the increment in BMD for men due to animal protein was not statistically significant (P=0.20). That is the smallest bar on the left. Does protein leach calcium from the bones? Based on this study, the reasonable answers to this question are yes for plant protein, and no for animal protein. For animal protein, it seems to be quite the opposite. Even more interesting, calcium intake did not seem to be much of a factor. BMD gains due to animal protein seemed to converge to similar values whether calcium intake was high, medium or low. The convergence occurred as animal protein intake increased, and the point of convergence was between 85-90 g/d of animal protein intake. And high calcium intakes did not seem to protect those whose plant protein consumption was high. The authors do not discuss specific foods, but one can guess the main plant protein that those folks likely consumed. It was likely gluten from wheat products. Are the associations above due to: (a) the folks eating animal protein consuming more fruits and vegetables than the folks eating plant protein; or (b) something inherent to animal foods that stimulates an increase in the absorption of dietary calcium, even in small amounts? This question cannot be answered based on this study; it should have controlled for fruit and vegetable consumption for that. But if I were to bet, I would bet on (b). Promislow, J.H.E., Goodman-Gruen, D., Slymen, D.J., & Barrett-Connor, E. (2002). Protein consumption and bone mineral density in the elderly. American Journal of Epidemiology, 155(7), 636–644. I have recently read an interesting study by Yashin and colleagues (2009) at Duke University’s Center for Population Health and Aging. (The full reference to the article, and a link, are at the end of this post.) This study is a gem with some rough edges, and some interesting implications. The study uses data from the Framingham Heart Study (FHS). The FHS, which started in the late 1940s, recruited 5209 healthy participants (2336 males and 2873 females), aged 28 to 62, in the town of Framingham, Massachusetts. At the time of Yashin and colleagues’ article publication, there were 993 surviving participants. I rearranged figure 2 from the Yashin and colleagues article so that the two graphs (for females and males) appeared one beside the other. The result is shown below (click on it to enlarge); the caption at the bottom-right corner refers to both graphs. The figure shows the age-related trajectory of blood glucose levels, grouped by lifespan (LS), starting at age 40. As you can see from the figure above, blood glucose levels increase with age, even for long-lived individuals (LS > 90). The increases follow a U-curve (a.k.a. J-curve) pattern; the beginning of the right side of a U curve, to be more precise. The main difference in the trajectories of the blood glucose levels is that as lifespan increases, so does the width of the U curve. In other words, in long-lived people, blood glucose increases slowly with age; particularly up to 55 years of age, when it starts increasing more rapidly. Now, here is one of the rough edges of this study. The authors do not provide standard deviations. You can ignore the error bars around the points on the graph; they are not standard deviations. They are standard errors, which are much lower than the corresponding standard deviations. Standard errors are calculated by dividing the standard deviations by the square root of the sample sizes for each trajectory point (which the authors do not provide either), so they go up with age since progressively smaller numbers of individuals reach advanced ages. So, no need to worry if your blood glucose levels are higher than those shown on the vertical axes of the graphs. (I will comment more on those numbers below.) Not everybody who lived beyond 90 had a blood glucose of around 80 mg/dl at age 40. I wouldn't be surprised if about 2/3 of the long-lived participants had blood glucose levels in the range of 65 to 95 at that age. Here is another rough edge. It is pretty clear that the authors’ main independent variable (i.e., health predictor) in this study is average blood glucose, which they refer to simply as “blood glucose”. However, the measure of blood glucose in the FHS is a very rough estimation of average blood glucose, because they measured blood glucose levels at random times during the day. 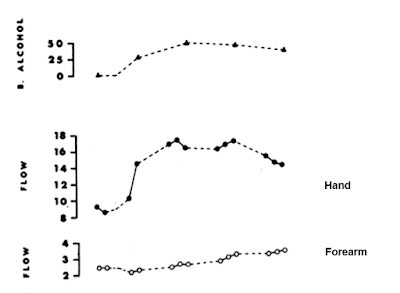 These measurements, when averaged, are closer to fasting blood glucose levels than to average blood glucose levels. A more reliable measure of average blood glucose levels is that of glycated hemoglobin (HbA1c). Blood glucose glycates (i.e., sticks to, like most sugary substances) hemoglobin, a protein found in red blood cells. Since red blood cells are relatively long-lived, with a turnover of about 3 months, HbA1c (given in percentages) is a good indicator of average blood glucose levels (if you don’t suffer from anemia or a few other blood abnormalities). Based on HbA1c, one can then estimate his or her average blood glucose level for the previous 3 months before the test, using one of the following equations, depending on whether the measurement is in mg/dl or mmol/l. The table below, from Wikipedia, shows average blood glucose levels corresponding to various HbA1c values. 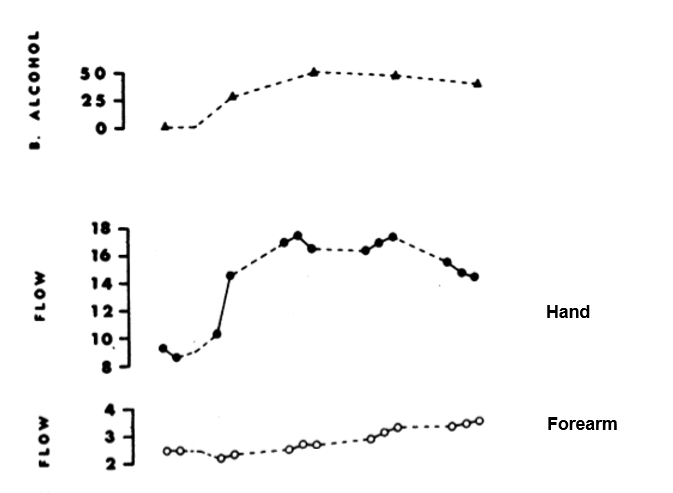 As you can see, they are generally higher than the corresponding fasting blood glucose levels would normally be (the latter is what the values on the vertical axes of the graphs above from Yashin and colleagues’ study roughly measure). This is to be expected, because blood glucose levels vary a lot during the day, and are often transitorily high in response to food intake and fluctuations in various hormones. Growth hormone, cortisol and noradrenaline are examples of hormones that increase blood glucose. Only one hormone effectively decreases blood glucose levels, insulin, by stimulating glucose uptake and storage as glycogen and fat. Nevertheless, one can reasonably expect fasting blood glucose levels to have been highly correlated with average blood glucose levels in the sample. So, in my opinion, the graphs above showing age-related blood glucose trajectories are still valid, in terms of their overall shape, but the values on the vertical axes should have been measured differently, perhaps using the formulas above. Ironically, those who achieve low average blood glucose levels (measured based on HbA1c) by adopting a low carbohydrate diet (one of the most effective ways) frequently have somewhat high fasting blood glucose levels because of physiological (or benign) insulin resistance. Their body is primed to burn fat for energy, not glucose. Thus when growth hormone levels spike in the morning, so do blood glucose levels, as muscle cells are in glucose rejection mode. This is a benign version of the dawn effect (a.k.a. dawn phenomenon), which happens with quite a few low carbohydrate dieters, particularly with those who are deep in ketosis at dawn. Yashin and colleagues also modeled relative risk of death based on blood glucose levels, using a fairly sophisticated mathematical model that takes into consideration U-curve relationships. What they found is intuitively appealing, and is illustrated by the two graphs at the bottom of the figure below. The graphs show how the relative risks (e.g., 1.05, on the topmost dashed line on the both graphs) associated with various ranges of blood glucose levels vary with age, for both females and males. What the graphs above are telling us is that once you reach old age, controlling for blood sugar levels is not as effective as doing it earlier, because you are more likely to die from what the authors refer to as “other causes”. For example, at the age of 90, having a blood glucose of 150 mg/dl (corrected for the measurement problem noted earlier, this would be perhaps 165 mg/dl, from HbA1c values) is likely to increase your risk of death by only 5 percent. The graphs account for the facts that: (a) blood glucose levels naturally increase with age, and (b) fewer people survive as age progresses. So having that level of blood glucose at age 60 would significantly increase relative risk of death at that age; this is not shown on the graph, but can be inferred. Here is a final rough edge of this study. From what I could gather from the underlying equations, the relative risks shown above do not account for the effect of high blood glucose levels earlier in life on relative risk of death later in life. This is a problem, even though it does not completely invalidate the conclusion above. As noted by several people (including Gary Taubes in his book Good Calories, Bad Calories), many of the diseases associated with high blood sugar levels (e.g., cancer) often take as much as 20 years of high blood sugar levels to develop. So the relative risks shown above underestimate the effect of high blood glucose levels earlier in life. Do the long-lived participants have some natural protection against accelerated increases in blood sugar levels, or was it their diet and lifestyle that protected them? This question cannot be answered based on the study. Assuming that their diet and lifestyle protected them, it is reasonable to argue that: (a) if you start controlling your average blood sugar levels well before you reach the age of 55, you may significantly increase your chances of living beyond the age of 90; (b) it is likely that your blood glucose levels will go up with age, but if you can manage to slow down that progression, you will increase your chances of living a longer and healthier life; (c) you should focus your control on reliable measures of average blood glucose levels, such as HbA1c, not fasting blood glucose levels (postprandial glucose levels are also a good option, because they contribute a lot to HbA1c increases); and (d) it is never too late to start controlling your blood glucose levels, but the more you wait, the bigger is the risk. Yashin, A.I., Ukraintseva, S.V., Arbeev, K.G., Akushevich, I., Arbeeva, L.S., & Kulminski, A.M. (2009). Maintaining physiological state for exceptional survival: What is the normal level of blood glucose and does it change with age? Mechanisms of Ageing and Development, 130(9), 611-618. Calcidiol is a pre-hormone that is produced based on vitamin D3 in the liver. Blood concentration of calcidiol is considered to be a reliable indicator of vitamin D status. In the research literature, calcidiol is usually referred to as 25-Hydroxyvitamin or 25(OH)D. Calcidiol is converted in the kidneys into calcitriol, which is the active form of vitamin D.
The table below (from: Vieth, 1999; full reference at the end of this post; click on it to enlarge), shows the average blood vitamin D levels of people living or working in sun-rich environments. To convert from nmol/L to ng/mL, divide by 2.496. For example, 100 nmol/L = 100 / 2.496 ng/mL = 40.1 ng/mL. At the time of this writing, Vieth (1999) had over 1500 citations on Google Scholar, and probably a large number as well on Web of Science. This article has had, and continues having, a high impact among researchers. 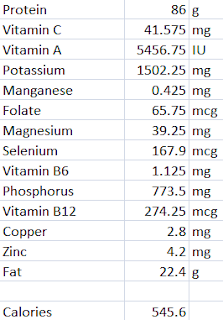 The maximum average level of blood (or serum) vitamin D shown in the table is 163 nmol/L (65 ng/mL). Given that the human body produces vitamin D naturally from sunlight, it is reasonable to assume that those blood vitamin D levels are not yet at the toxic range. In fact, one of the individuals, a farmer in Puerto Rico, had a level of 225 nmol/L (90 ng/mL). That individual had no signs of toxicity. Several studies show that pre-sunburn full-body exposure to sunlight is equivalent to an oral vitamin D intake of approximately 250 µg (10,000 IU). In spite of claims to the contrary, vitamin D production based on sunlight does not cease after 40 years of age or so. Studies reviewed by Vieth suggest that among the elderly (i.e., those aged 65 or above) pre-sunburn full-body exposure to sunlight is equivalent to an oral vitamin D intake of 218 µg (8,700 IU). Sunlight-induced vitamin D production does seem to decrease with age, but not dramatically. Post-sunburn sunlight exposure does not increase vitamin D production. Since each person is different, a good rule of thumb to estimate the number of minutes of sunlight exposure needed to maximize vitamin D production is the number of minutes preceding sunburn. For a light-skinned person, this can be as little as 7 minutes. Vitamin D accumulation in the body follows a battery-like pattern, increasing and decreasing gradually. The figure below, from Vieth’s article, shows the gradual increase in blood vitamin D concentrations following the start of daily supplementation. This suggests that levels start to plateau at around 1 month, with higher levels reaching a plateau after 2 months. While sunlight exposure does not lead to toxic levels of vitamin D, oral intake may. Below is a figure, also from Vieth’s article, that plots blood levels of vitamin D against oral intake amounts. The X’s indicate points at which intoxication symptoms were observed. While typically intoxication starts at the 50,000 IU intake level, one individual displayed signs of intoxication at 10,000 IU. That individual received a megadose that was supposed to provide vitamin D for an extended period of time. Non-toxic levels of 10,000 IU are achieved naturally through sunlight exposure. This applies to modern humans and probably our Paleolithic ancestors. Yet, modern humans normally limit their sun exposure and intake of vitamin D to levels (400 IU) that are only effective to avoid osteomalacia, the softening of the bones due to poor mineralization. Very likely the natural production of 10,000 IU based on sunlight was adaptive in our evolutionary past, and also necessary for good health today. This is consistent with the many reports of diseases associated with chronic vitamin D deficiency, even at levels that avoid osteomalacia. Among those diseases are: hypertension, tuberculosis, various types of cancer, gingivitis, multiple sclerosis, chronic inflammation, seasonal affective disorder, and premature senescence. Reinhold Vieth (May 1999). Vitamin D supplementation, 25-hydroxyvitamin D concentrations, and safety. American Journal of Clinical Nutrition, Vol. 69, No. 5, 842-856. Niacin is a very interesting vitamin. It is also known as vitamin B3, or nicotinic acid. It is an essential vitamin whose deficiency leads to a dreadful disease known as pellagra. In large doses of 1 to 3 g per day it has several effects on blood lipids, including these: it increases HDL cholesterol, decreases triglycerides, and decreases Lp(a). Given that this is essentially a reversal of the metabolic syndrome, for those who are on their way to developing it, niacin must really do something good for our body. Niacin is also a powerful antioxidant. The lipid modification effects of niacin are so consistent across a broad spectrum of the population that some companies that commercialize niacin-based products guarantee some measure of those effects. The graphs below (click to enlarge) are from Arizona Pharmaceuticals, a company that commercializes an instant-release niacin formulation called Nialor (see: arizonapharmaceuticals.com). The graphs show the peak effects on HDL cholesterol and triglycerides at the recommended dose, which is 1.5 g per day. The company guarantees effects; not the peak effects shown, but effects that are large enough to have clinical significance. Niacin also has been used in the treatment of various mental disorders, including schizophrenia. Its effectiveness in this domain (mental disease) is still under debate. Yet many people, including reputable mental health researchers, swear by it. Empirical research suggests beyond much doubt that niacin helps in the treatment of depression and bipolar disorder. By the way, moderate niacin supplementation seems to increase the milk output of cows, without any effect on milk composition. Most people dislike the sensation that is caused by niacin, the “niacin flush”. This is a temporary sensation similar to that of sunburn covering one’s full torso and face. It goes away after a few minutes. This is niacin’s main undesirable side effect at doses up to 3 g per day. Higher doses are not recommended, and can be toxic to the liver. Nobody seems to understand very well how niacin works. This leads to some confusion. Many people think that niacin inhibits the production of VLDL, free fatty acids, and ketones; preventing the use of fat as an energy source. And it does! So it makes you fat, right? No, because these effects are temporary, and are followed, often after 3 to 5 hours, by a large increase in circulating growth hormone, cortisol and glucagon. These hormones are associated with (maybe they cause, maybe are caused by) a large increase in free fatty acids and ketones in circulation, but not with an increase in VLDL secretion by the liver. So ketosis is at first inhibited by niacin, and then comes in full force after a few hours. The decreased VLDL secretion is no surprise, because VLDL is not really needed in large quantities if muscle tissues (including the heart) are being fed what they really like: free fatty acids and ketones. When VLDL particles are secreted by the liver in small numbers, they tend to be large. As they shrink in size after delivering their lipid content to muscle tissues, they become large LDL particles; too large to cross the endothelial gaps and cause plaque formation. It is as if niacin held you back for a few hours, in terms of fat burning, and then released you with a strong push. Since niacin does not seem to suppress the secretion of chylomicrons by the intestines, it should be taken with meals. The meals do not necessarily have to have any carbohydrates in them. If you take niacin while fasting, you may feel “funny” and somewhat weak, because of the decrease in VLDL, free fatty acids, and ketones in circulation. These, particularly the free fatty acids and ketones, are important sources of energy in the fasted state. Given niacin’s delayed effects, it does not seem to make much sense to take slow release niacin of any kind. In fact, the form of niacin that seems to work best is the instant-release one, the one that gives you the flush. It may be a good idea to wait until 3 to 5 hours after you take it to do heavy exercise. You may feel a surge of energy 3 to 5 hours after taking it, when the delayed effects kick in. The delayed effects of niacin on growth hormone, cortisol and glucagon are probably the reasons why people taking niacin frequently see a small increase in fasting glucose levels. This increase is usually of a few percentage points, but can be a bit higher in some people. Growth hormone, cortisol and particularly glucagon increase blood glucose levels; and the blood levels of these hormones naturally rise in the morning to get you ready for the day ahead. Niacin seems to boost that. Hence the increase in fasting blood glucose levels. This appears to be a benign effect, easily counterbalanced by niacin’s many benefits. In spite of a possible increase in fasting glucose levels, there is no evidence that niacin increases average blood glucose levels. If it did, that would not be a good thing. In fact, it has been argued that niacin intake can be part of an effective approach to treating diabetes; Robert C. Atkins discussed this in his Vita-Nutrient Solution book. Niacin’s effects on lipids are somewhat similar to those of low carbohydrate dieting. For example, both lead to a decrease in fasting triglycerides and an increase in HDL cholesterol. But the mechanisms by which those effects are achieved appear to be rather different. Quabbe, H.J., Trompke, M., & Luyckx, A.S. (1983). Influence of ketone body infusion on plasma growth hormone and glucagon in man. J. Clin Endocrinol Metab., 57(3):613-8. Quabbe, H.J., Luyckx, A.S., L'age M., & Schwarz, C. (1983). Growth hormone, cortisol, and glucagon concentrations during plasma free fatty acid depression: different effects of nicotinic acid and an adenosine derivative (BM 11.189). J. Clin Endocrinol Metab., 57(2):410-4. Schade, D.S., Woodside, W., & Eaton, R.P. (1979). The role of glucagon in the regulation of plasma lipids. Metabolism, 28(8):874-86. The bar chart below shows the fat content of 1 sardine (38 g) canned in tomato sauce, and 2 fish oil softgels of the Nature Made brand. (The sardine is about 1/3 of the content of a typical can, and the data is from Nutritiondata.com. The two softgels are listed as the “serving size” on the Nature Made bottle.) Both the sardine and softgels have some vegetable oil added; presumably to increase their vitamin E content and form a more stable oil mix. This chart is a good reminder that looking at actual numbers can be quite instructive sometimes. Even though the chart focuses on fat content, it is worth noting that the 38 g sardine also contains 8 g of high quality protein. If your goal with the fish oil is to “neutralize” the omega-6 fat content of your diet, which is most people’s main goal, you should consider this. A rough measure of the omega-6 neutralization “power” of a food portion is, by definition, its omega-3 minus omega-6 content. For the 1 canned sardine, this difference is 596 mg; for the 2 fish oil softgels, 440 mg. The reason is that the two softgels have more omega-6 than the sardine. In case you are wondering, the canning process does not seem to have much of an effect on the nutrient composition of the sardine. There is some research suggesting that adding vegetable oil (e.g., soy) helps preserve the omega-3 content during the canning process. There is also research suggesting that not much is lost even without any vegetable oil being added. Fish oil softgels, when taken in moderation (e.g., two of the type discussed in this post, per day), are probably okay as “neutralizers” of omega-6 fats in the diet, and sources of a minimum amount of omega-3 fats for those who do not like seafood. For those who can consume 1 canned sardine per day, which is only 1/3 of a typical can of sardines, the sardine is not only a more effective source of omega-3, but also a good source of protein and many other nutrients. As far as balancing dietary omega-6 fats is concerned, you are much better off reducing your consumption of foods rich in omega-6 fats in the first place. Apparently nothing beats avoiding industrial seed oils in that respect. It is also advisable to eat certain types of nuts with high omega-6 content, like walnuts, in moderation. Both omega-6 and omega-3 fats are essential; they must be part of one’s diet. The actual minimum required amounts are fairly small, probably much lower than the officially recommended amounts. Chances are they would be met by anyone on a balanced diet of whole foods. Too much of either type of fat in synthetic or industrialized form can cause problems. A couple of instructive posts on this topic are this post by Chris Masterjohn, and this one by Chris Kresser. Even if you don’t like canned sardines, it is not much harder to gulp down 38 g of sardines than it is to gulp down 2 fish oil softgels. You can get the fish oil for $12 per bottle with 300 softgels; or 8 cents per serving. You can get a can of sardines for 50 cents; which gives 16.6 cents per serving. The sardine is twice as expensive, but carries a lot more nutritional value. You can also buy wild caught sardines, like I do. I also eat canned sardines. Wild caught sardines cost about $2 per lb, and are among the least expensive fish variety. They are not difficult to prepare; see this post for a recipe. I don’t know how many sardines go into the industrial process of making 2 fish oil softgels, but I suspect that it is more than one. So it is also probably more ecologically sound to eat the sardine. The study was presented as being somewhat pessimistic: one cannot drink as much as previous data suggested. Let’s see. Two drinks of a spirit (e.g., whiskey) served “neat” (i.e., with nothing added to it) will typically add up to about 84 g; or 3 oz. If the alcohol content is 40 percent, such a double drink will contain about 33 g of alcohol. So, according to this study, you can still enjoy three double drinks of spirit per week, or six single drinks – which is almost one per day. That is not so little. This study is consistent with most studies of the effect of alcohol consumption on health, which generally show results in terms of averages within fixed ranges of consumption. For example, they will show average mortality risks for people consuming 1, 2, 3 etc. drinks per day. 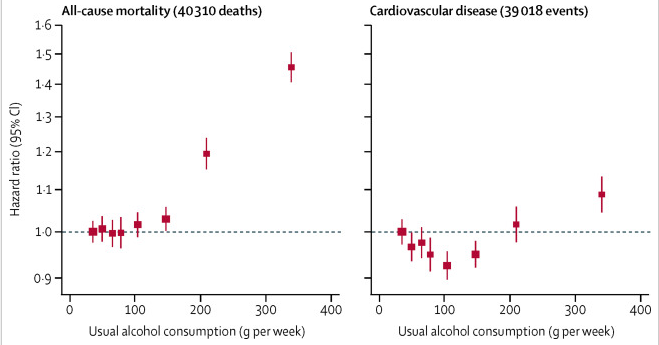 These studies suggest that there is a J-curve relationship between alcohol consumption and health. That is, drinking a little is better than not drinking; and drinking a lot is worse than drinking a little. Contrary to popular belief, the positive health effects of moderate alcohol consumption have little, if anything, to do with polyphenols such as resveratrol. Resveratrol, once believed to be the fountain of youth, is found in the skin of red grapes. It is in fact the alcohol content that has positive effects, apparently reducing the incidence of coronary heart disease, diabetes, hypertension, congestive heart failure, stroke, dementia, Raynaud’s phenomenon, and all-cause mortality. Raynaud's phenomenon is associated with poor circulation in the extremities (e.g., toes, fingers), which in some cases can progress to gangrene. In most studies of the effects of alcohol consumption on health, the J-curves emerge from visual inspection of the plots of averages across ranges of consumption. Rarely you find studies where nonlinear relationships are “discovered” by software tools such as WarpPLS (), with effects being adjusted accordingly. Still, this study is indeed consistent with some past studies suggesting that the amount of alcohol intake that is optimal maybe less than most of us think (). Trying to understand each body response to each diet and lifestyle change, individually, is certainly a losing battle. It is a bit like the various attempts to classify organisms that occurred prior to solid knowledge about common descent. Darwin’s theory of evolution is a theory of common descent that makes classification of organisms a much easier and logical task. Compensatory adaptation (CA) is a broad theoretical framework that hopefully can help us better understand responses to diet and lifestyle changes. CA is a very broad idea, and it has applications at many levels. I have discussed CA in the context of human behavior in general (Kock, 2002), and human behavior toward communication technologies (Kock, 2001; 2005; 2007). Full references and links are at the end of this post. CA is all about time-dependent adaptation in response to stimuli facing an organism. The stimuli may be in the form of obstacles. From a general human behavior perspective, CA seems to be at the source of many success stories. A few are discussed in the Kock (2002) book; the cases of Helen Keller and Stephen Hawking are among them. People who have to face serious obstacles sometimes develop remarkable adaptations that make them rather unique individuals. Hawking developed remarkable mental visualization abilities, which seem to be related to some of his most important cosmological discoveries. Keller could recognize an approaching person based on floor vibrations, even though she was blind and deaf. Both achieved remarkable professional success, perhaps not as much in spite but because of their disabilities. From a diet and lifestyle perspective, CA allows us to make one key prediction. The prediction is that compensatory body responses to diet and lifestyle changes will occur, and they will be aimed at maximizing reproductive success, but with a twist – it’s reproductive success in our evolutionary past! We are stuck with those adaptations, even though we live in modern environments that differ in many respects from the environments where our ancestors lived. Note that what CA generally tries to maximize is reproductive success, not survival success. From an evolutionary perspective, if an organism generates 30 offspring in a lifetime of 2 years, that organism is more successful in terms of spreading its genes than another that generates 5 offspring in a lifetime of 200 years. This is true as long as the offspring survive to reproductive maturity, which is why extended survival is selected for in some species. We live longer than chimpanzees in part because our ancestors were “good fathers and mothers”, taking care of their children, who were vulnerable. If our ancestors were not as caring or their children not as vulnerable, maybe this blog would have posts on how to control blood glucose levels to live beyond the ripe old age of 50! The CA prediction related to responses aimed at maximizing reproductive success is a straightforward enough prediction. The difficult part is to understand how CA works in specific contexts (e.g., Paleolithic dieting, low carbohydrate dieting, calorie restriction), and what we can do to take advantage (or work around) CA mechanisms. For that we need a good understanding of evolution, some common sense, and also good empirical research. One thing we can say with some degree of certainty is that CA leads to short-term and long-term responses, and that those are likely to be different from one another. The reason is that a particular diet and lifestyle change affected the reproductive success of our Paleolithic ancestors in different ways, depending on whether it was a short-term or long-term change. The same is true for CA responses at different stages of one’s life, such as adolescence and middle age; they are also different. This is the main reason why many diets that work very well in the beginning (e.g., first months) frequently cease to work as well after a while (e.g., a year). Also, CA leads to psychological responses, which is one of the key reasons why most diets fail. Without a change in mindset, more often than not one tends to return to old habits. Hunger is not only a physiological response; it is also a psychological response, and the psychological part can be a lot stronger than the physiological one. It is because of CA that a one-month moderately severe calorie restriction period (e.g., 30% below basal metabolic rate) will lead to significant body fat loss, as the body produces hormonal responses to several stimuli (e.g., glycogen depletion) in a compensatory way, but still “assuming” that liberal amounts of food will soon be available. Do that for one year and the body will respond differently, “assuming” that food scarcity is no longer short-term and thus that it requires different, and possibly more drastic, responses. Among other things, prolonged severe calorie restriction will lead to a significant decrease in metabolism, loss of libido, loss of morale, and physical as well as mental fatigue. It will make the body hold on to its fat reserves a lot more greedily, and induce a number of psychological responses to force us to devour anything in sight. In several people it will induce psychosis. The results of prolonged starvation experiments, such as the Biosphere 2 experiments, are very instructive in this respect. It is because of CA that resistance exercise leads to muscle gain. Muscle gain is actually a body’s response to reasonable levels of anaerobic exercise. The exercise itself leads to muscle damage, and short-term muscle loss. The gain comes after the exercise, in the following hours and days (and with proper nutrition), as the body tries to repair the muscle damage. Here the body “assumes” that the level of exertion that caused it will continue in the near future. If you increase the effort (by increasing resistance or repetitions, within a certain range) at each workout session, the body will be constantly adapting, up to a limit. If there is no increase, adaptation will stop; it will even regress if exercise ceases altogether. Do too much resistance training (e.g., multiple workout sessions everyday), and the body will react differently. Among other things, it will create deterrents in the form of pain (through inflammation), physical and mental fatigue, and even psychological aversion to resistance exercise. CA processes have a powerful effect on one’s body, and even on one’s mind! Kock, N. (2001). Compensatory Adaptation to a Lean Medium: An Action Research Investigation of Electronic Communication in Process Improvement Groups. IEEE Transactions on Professional Communication, 44(4), 267-285. Kock, N. (2005). Compensatory adaptation to media obstacles: An experimental study of process redesign dyads. Information Resources Management Journal, 18(2), 41-67. Kock, N. (2007). Media Naturalness and Compensatory Encoding: The Burden of Electronic Media Obstacles is on Senders. Decision Support Systems, 44(1), 175-187. Many years ago I lost 60 lbs (27 kg) over a period of about 2-3 years, and kept it off. Often people are surprised when I show them an old picture of myself, where I am visibly obese (). I have always felt that one of the keys to losing a significant amount of body fat without triggering body starvation responses is to eat a diet that has a high nutrient-to-calorie ratio. The baked cod and lobster dish below, with photos before and after baking, is a good example of a meal in such a diet. This is a fairly simple meal to prepare; simple and delicious. The cost of this dish goes down significantly if you do not include the lobster. Below is a recipe. I used it to prepare the baked cod and lobster shown on the photos above. - Cut and spread on two sheet pans about 4 tomatoes, 1 cup of onion, 1 cup of spinach, 2 lbs of cod, and 4 lobster tails (approx. 4 oz each). - Add some butter to the mix. I recommend more butter on the lobster than on the cod. - Preheat the oven to 350 degrees Fahrenheit. - Add seasoning to taste. I suggest using a small amount of salt, and some chili powder, garlic powder, cayenne pepper, and herbs. - Bake for about 30 minutes, or until the lobster is soft. Let us say you are hungry, so you eat about one-fourth of all of this. That is one lobster tail and about a quarter of the cod dish. The nutrition content of such a meal is shown below. So you will be getting about 86 g of protein in this one single meal. The vitamins and mineral contents listed are mostly above 100 percent of the usually recommended intake. All of this while taking in only a little over 500 calories. It is very difficult to get fat eating like this! Ketones are compounds that have a specific chemical structure. The figure below (from: Wikipedia) shows the chemical structure of various types of ketones. As you can see, all ketones share a carbonyl group; that is the “O=” part of their chemical structure. A carbonyl group is an oxygen atom double-bonded to a carbon atom. Technically speaking, many substances can be classified as ketones. Not all of these are involved in the same metabolic processes in humans. For example, fructose is technically a ketone, but it is not one of the three main ketones produced by humans from dietary macronutrients (discussed below), and is not metabolized in the same way as are those three main ketones. Humans, as well as most other vertebrates, produce three main ketones (also known as ketone bodies) from dietary macronutrients. These are acetone, acetoacetate and beta-hydroxybutyrate. Low carbohydrate diets tend to promote glycogen depletion, which in turn leads to increased production of these ketones. Glycogen is stored in the liver and muscles. Liver glycogen is used by the body to maintain blood glucose levels within a narrow range in the fasted state. Examples of diets that tend to promote glycogen depletion are the Atkins Diet and Kwaśniewski’s Optimal Diet. A search for articles on ketosis in scientific databases usually returns a large number of articles dealing with ketosis in cows. Why? The reason is that ketosis reduces milk production, by both reducing the amount of fat and glucose available for milk synthesis. In fact, ketosis is referred to as a “disease” in cows. In humans, most articles on ketosis refer to pathological ketosis (a.k.a. ketoacidosis), especially in the context of uncontrolled diabetes. One notable exception is an article by Williamson (2005), from which the table below was taken. The table shows ketone concentrations in the blood under various circumstances, in mmol/l. Situations in which ketosis occurs in newborn babies (neonate), in adults post-exercise, and in adults fed a high fat diet are all examples of physiological, or benign, ketosis. Ketones are also found in low concentrations in adults fed a standard American diet. Ketones are found in very high concentrations in adults with untreated diabetes. This is an example of pathological ketosis, even though ketones are produced as part of a protective compensatory mechanism to spare glucose for the brain and red blood cells (which need glucose to function properly). Pathological ketosis leads to serum ketone levels that can be as much as 80 times (or more) those found in physiological ketosis. Serum ketone concentrations increase proportionally to decreases in stored glycogen and, when glycogen is low or absent, correlate strongly (and inversely) with blood glucose levels. In some individuals glycogen is practically absent due to a genetic condition that leads to hepatic glycogen synthase deficiency. This is a deficiency of the enzyme that promotes glycogen synthesis by the liver. The figure below (also from Williamson, 2005) shows the variations in glucose and ketone levels in a child with glycogen synthase deficiency. Unlike glucose and lipoprotein-bound fats (in VLDL, for example), unused ketones cannot be converted back to substances that can be stored by the body. Thus excess ketones are eliminated in the urine; leading to their detection by various tests, e.g., Ketostix tests. This elimination of unused ketones in the urine is one of the reasons why low carbohydrate diets are believed to lead to enhanced body fat loss. In summary, ketones are present in the blood most of the time, in most people, whether they are on a ketogenic diet or not. If they do not show up in the urine, it does not mean that they are not present in the blood; although it usually means that their concentration in the blood is not that high. Like glucose, ketones are soluble in water, and thus circulate in the blood without the need for carriers (e.g., albumin, which is needed for the transport of free fatty acids; and VLDL, needed for the transport of triglycerides). Like glucose, they are used as sources of energy by the brain and by muscle tissues. It has been speculated that ketosis leads to accelerated aging, through the formation of advanced glycation endproducts (AGEs), a speculation that seems to be largely unfounded (see this post). It is difficult to believe that a metabolic process that is universally found in babies and adults post-exercise would have been favored by evolution if it led to accelerated aging. Williamson, D.H. (2005). Ketosis. Encyclopedia of Human Nutrition, 91-98.